Despite having in the past worked for an electronics hobbyist magazine, and having played with electronics for most of my life, I don’t consider myself to be any sort of electronics whiz. In fact, I am painfully aware of how little I know and understand. But that’s one reason I am so pleased that together with eLabtronics, we’ve been developing a whole range of off-the-shelf electronic performance modules. Well, I’ve seen it so often. Someone will ask on a discussion group or in a car club for some simple electronic device. Like, they want to automatically turn on something when a certain voltage is reached. Or they want to flash a light. Or they want a simple timer. Always – absolutely always – there’ll be an electronics whiz that will come out of the woodwork. Then expert says it all again, although this time faster and maybe with a URL for a circuit. “OK I think I am getting it now. “So how do I make the flash rate variable? The answer of course is: no, a 555 IC won’t be able to handle the required power. And neither will it like working in a car without any protection circuitry on its power supply leads…. In fact, for every ‘simple’ circuit request, there are always – but always – complexities that are easy to overlook. So when I say that I started working with eLabtronics over 10 months ago – and the first product is being written about in AutoSpeed only this week – you get some idea of what goes into apparently simple designs. Of course, the eLabtronics Multi Purpose Module isn’t just a flasher. Or a voltage switch. Or a timer. The same hardware will be able to do all these functions – and plenty more – just by software changes made by the company. Which brings me back to the beginning. In the past we’ve covered a range of DIY modules in kit form. They were (and remain) very good designs – but the user had to build them. And many people aren’t confident or happy building electronic kits where just one, apparently trivial, wiring error can stop the whole thing from ever working. The new eLabtronics modules are fully built and tested. Courtesy of their microcontroller design, they also have far more flexibility and options than those previous kits. The ‘expert’ quoted above will be dismissive. But the electronics non-expert, who just wants to do all those apparently simple things, will love them…. Wrecking yards are better than ever! I want to be able to adjust my injectors on a Mazda MX-6 (’90) so that each injector is adjustable in terms of duty cycle. I thought about using a needle valve between the injector and the fuel rail but it looks to bulky and clumsy. I was hoping that there is a suitable kit (Autospeed) that can do the trick so that I can individual tune each injector output like I would on an IR intake. Got anythin? You could use four Digital Pulse Adjusters – see Jaycar Electronics for kit. But why the need to change them individually? I have been reading some articles by David Vizard where due to varying path lengths and crosstalk between cylinders that the air/fuel ratio varies enough between cylinders that tuning them (with the help of a colortune) could increase performance. I thought that since the DPAs were very reasonable this would be a good opportunity to explore. What do you think? I forgot to ask how would you connect 4 DPAs? I suppose using just one DPA would slot between the ECU and the injectors. But with 4 DPAs it seems there would be extra connections that wouldn’t be used. Any help, pointers, etc. would be appreciated. Thanks. One DPA would drive one injector. But did you read the cited article? It would seem a lot of effort for little gain. Yeah, I read the articles. Appreciated them very much too. The expected gain could be in either performance or economy. Perhaps you could do this yourself. It would make for a nice Autospeed article. Over here in the states many are now starting to consider mpg economy to be just as important as performance. I guess what would tell if this may be worth anything would be to get the colortunes and see what the individual cylinder mixtures look like. Thanks for the quick responses. One other comment. Would I be correct in assuming from your posts that you would expect that there would be little or no difference between the cylinde mixtures on a common plenum 4 cylinder engine? It would be my guess that you’d need individual cylinder air/fuel ratio analysis (eg broadband sensors, one per cylinder) and then individual mapping, that could vary depending on aspects such as rpm and throttle position. For what (again, a guess) would be a very small change in overall fuel economy. Certainly, I wouldn’t dream of doing this myself – far easier things to do first when aiming at improved fuel economy. I’m located in Manitoba, Canada. I just did the shipping calculation for one of the “eLabtronics Pulser Module – Pre Built” modules, and by International Express Courier – Express it’s going to cost $46.50. 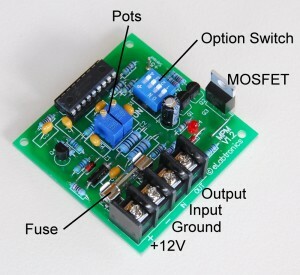 Since this almost doubles the cost of the module, I’m wondering if there is an “eLabtronics Pulser Module – parts list” (for electronic delivery) or any other way to obtain the schematic so I can build the module using locally obtained parts? Or perhaps there is a Canadian company that you have some type of partnership with where we could purchase the module? I am certainly open to suggestions or any other help you can offer. Thanks in advance. The eLabtronics modules are not available as kits. I don’t have anything to do with the shop but I would think that there are cheaper postage options available. Hey Julian do you think it’s possible to use the more advanced model of these to be a simplistic fuel only engine management for a 50cc two stroke? As in manually doing the equivalent of a map.